Living in Macungie gives active adults easy access to nature and daily necessities. If you’re not familiar with Macungie, it's a small borough with just over 3,000 residents located about 10 miles west of Allentown. 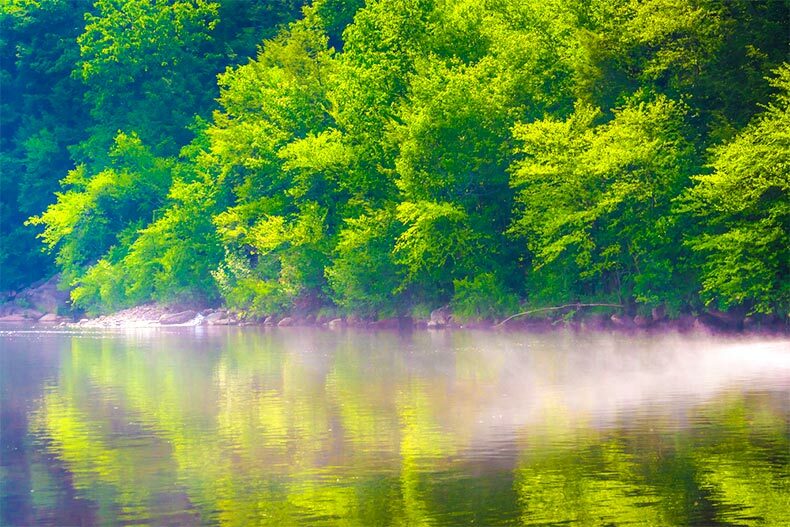 It's located in the scenic Lehigh Valley, a hilly region in Eastern Pennsylvania that is known far and wide for its beautiful countryside, charming towns, parks, and rich cultural history. Macungie, PA real estate may not be overly plentiful, but there are some excellent retirement communities that offer pristine locations with the advantages of being near a big city. Macungie’s history dates back to 1735, when the area was settled by early German immigrants. It is now home to the Brookside Country Club, which boasts an 18-hole championship course, a swim complex, tennis facilities, and elegant dining options. There is also a public pool, and Kalmbach Memorial Park, which has well-maintained grounds and facilities plus community programs. There are plenty of shops and services right in town and for heavy-duty shopping and errands, Allentown is just minutes away. The area is served by the Lehigh Valley Health Network, which has several campuses in the area. Residents enjoy spending time at Macungie Memorial Park, which has a fun playground for grandchildren, yearly events like antique truck shows and dog shows, and a summer farmers market. For a little music, The Macungie Band is a small town band that performs throughout the year in local venues. The historic Miller Symphony Hall in Allentown, the largest of its kind in the Lehigh Valley, showcases performances by The Allentown Symphony and other groups. Allentown’s other main attractions include viewing artwork at the Allentown Art Museum, catching a minor league game at Coca Cola Park, and scratching that shopping itch at the Lehigh Valley Mall. Historic Bethlehem, PA is about six miles from Allentown, and is home to the Sands Casino Resort, while Steel Stacks is a popular venue for live performances, films, delicious food, festivals, and other special events. Here are three of the 55+ communities with homes for sale in Macungie, PA. Built from 2001 to 2004, Wild Cherry Knoll is a smaller-sized, gated 55+ community has 205 attached and single family homes. Models range from 1,500 to 2,858 square feet with two or three bedrooms, two to three-and-a-half bathrooms, and two-car garages. These well-appointed homes feature expansive master suites and open floor plans. Wild Cherry Knoll’s private clubhouse affords homeowners the opportunity to enjoy its comfy social rooms and TV lounge, and there is an on-site catering kitchen and bar for parties. There is also an exercise room, a library, and hobby rooms. The outdoor patio area has an outdoor heated pool, and there are tennis and bocce courts on the property. Social and activity groups include game nights, quilting, table tennis, and water aerobics. Four Seasons at Farmington is an age-restricted community consisting of 256 single-family resale homes. A gated neighborhood, it has the upscale amenities you expect from Four Seasons, with home upgrades like granite countertops, hardwood floors, and vaulted ceilings. The homes range from 1,546 to 2,902 square feet and have two bedrooms, two bathrooms, and attached two-car garages. The largest model features a family room, a home office, and an owner’s suite. The clubhouse has a well-equipped exercise room and several multi-purpose rooms. On the grounds, you will find an outdoor pool and patio, a walking & biking trail, a 6-hole golf course, and tennis courts. There are five parks within three miles of Four Seasons at Farmington, including Bob Rodale Cycling and Fitness Park, a great place to exercise in a natural setting. The nearby Lower Macungie Township Community Center sponsors interesting programs, like baking classes, paint parties, and ballroom dancing lessons. Legacy Oaks at Lehigh Valley is an intimate community of 112 attached resale homes that's great for active adults looking to downsize and live low-maintenance, rewarding lifestyles. It's located off Route 100, which is dotted with shops, banks, grocery stores, and everything else you might need. Legacy Oaks is also under a mile from Brookside Country Club, which has an 18-hole championship golf course, a top-notch tennis program, swimming, and its own fitness center. Those who prefer staying closer to home can head to the Legacy Oaks clubhouse, which has its own pool and patio, tennis, exercise room, trails, and fishing lakes. Friends also enjoy socializing at holiday dinners, casino nights, book club, Mahjong, and pot luck dinners. The attached homes here are split up into 24 quad units, 14 twin units, and 74 single units. They range from 1,550 square feet to 2,333 square feet with two or three bedrooms, two or three bathrooms, and attached two-car garages. Most have large master suites and open floor plans, and available options include lofts and sunrooms.